A great shot here from the back of the Kop at Elland Road looking down at how Elland Road used to be. At the South of the ground you can see the old Scratching Shed formerly known as The Terrace, in the 1920's this stand was covered with the barrel shaped roof we see in the picture and The Terrace became known as the Scratching Shed. 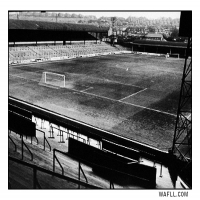 Around the same time the stand to the left of the pitch was built that run along the entire length of the pitch, this stand acquired the name The Lowfields. Both the Lowfields and Scratching Shed are no longer part of Elland Road. 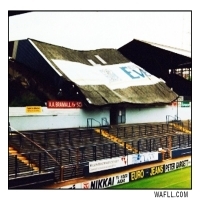 The Scratching Shed was pulled down in 1974 and in its place came The South Stand we have today. The Lowfields stand was demolished in 1992 to make way for the East Stand. Pic comes courtesy of Click the banner to visit. An unhappy pic of the old Lowfields Road stand here half way through the stages of demolition. The United sponsor logo (at the time) the Evening Post, partially seen for the last time. The Lowfields stand was demolished in 1992 to make way for the East Stand. The Lowfields Stand was erected in the 1920's and the lower tier terracing ran the entire length of the East side of Elland Road. The seated upper tier with roof stretched over half the distance of the terracing. 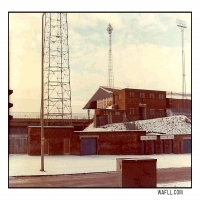 A snow covered Lowfields here giving the old stand a quaint Christmas Card affect. This shot taken from the East of the stadium in 1978. The Lowfields Stand was erected in the 1920's and the lower tier terracing ran the entire length of the East side of Elland Road. The seated upper tier with roof stretched over half the distance of the terracing. In 1992 the Lowfields Stand was demolished to make way for the new all seater East Stand. Thanks to FINwhite for this great pic. This shot taken from the North West corner of the ground of the initial construction work going on at the South East corner of the East Stand here. The Lowfields terracing was kept in place while the construction work on the actual East Stand went on. The East Stand is a large all seated stand with two tiers situated at the East side of Elland Road. After completion in 1993 at a cost of £5.5m, it boasted 25 extra Executive Boxes, a 10,000 all seated bottom tier to for the Family Stand members and a full capacity of over 17,000 all seated. The East Stand is one of the biggest cantilever stands in the world. Thanks to Quiffy for this great pic. 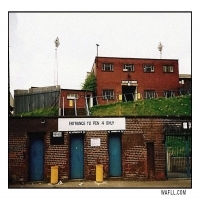 An unhappy shot here of the old Lowfields Stand at Elland Road. 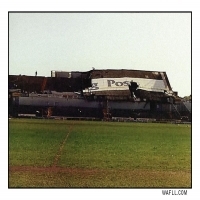 The roof of the seating area seen collapsed over the stands terracing, the United's sponsor (at the time) logo the Evening Post partially seen for the last time. The Lowfields stand was demolished in 1992 to make way for the East Stand. The Lowfields Stand was erected in the 1920's and the lower tier terracing ran the entire length of the East side of Elland Road. The seated upper tier with roof stretched over half the distance of the terracing. 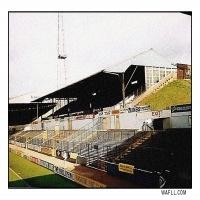 A classic shot here of one of the old Diamond Light floodlights at Elland Road. 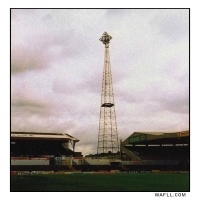 Three of the four floodlights were erected at Elland Road in 1974 at a whopping 260 feet tall. The floodlight in the pic situated at the South East corner of the stadium was the last floodlight to be erected this one was put up in 1978 four years later then the previous three. Each floodlight housed 55 lamps. Unfortunately the floodlights were brought down shortly after the East Stand was built. Claasic shot here of the rear of the Lowfields Stand at Elland Road. The gates shown in the pic were for the Leeds United fans which were exactly adjacent to the away supporter turnstiles. The Lowfields Stand was erected in the 1920's and the lower tier terracing ran the entire length of the East side of Elland Road. The seated upper tier with roof stretched over half the distance of the terracing. In 1992 the Lowfields Stand was demolished to make way for the new all seater East Stand. 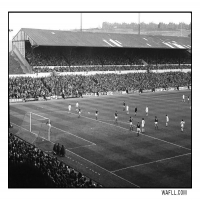 Vintage Elland Road. A superb look at the old Lowfields Stand taken from the Gelderd End behind the goals. The Lowfields Stand was erected in the 1920's and the lower tier terracing ran the entire length of the East side of Elland Road. The seated upper tier with roof stretched over half the distance of the terracing. In 1992 the Lowfields Stand was demolished to make way for the new all seater East Stand. 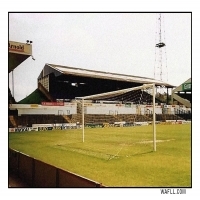 Classic shot here taken from the South Stand area of the old Lowfields Stand at Elland Road. The Lowfields Stand was erected in the 1920's and the lower tier terracing ran the entire length of the East side of Elland Road. The seated upper tier with roof stretched over half the distance of the terracing. 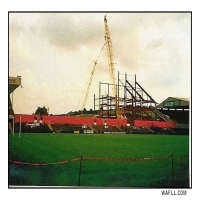 In 1992 the Lowfields Stand was demolished to make way for the new all seater East Stand. A shot of the Lowfields here taken during the first division clash with Leicester City in the season 1974-75. The game ended in a 2-2 draw and was watched by 29,898 spectatators. Johnny Giles and Allan Clarke got the goals for United. Manager Armfield had inherited Clough's bad start to the season and couldn't turn that round although United finished in a reasonable 9th position despite Clough's earlier failures. Leeds United: Stewart, Reaney, F.Gray, Bremner, McQueen, Hunter, McKenzie, Clarke, Jordan, Giles, Yorath. 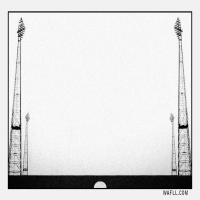 When in place at Elland Road these were the tallest floodlights in Europe. Constructed in 1974 at a whopping 260 feet tall, initially three floodlights were erected. Two at either side of the Kop and the other in the South West corner. The other was put up in the South East corner adjacent to the old Lowfields four years later. The diamond shaped lights could have been seen for miles around and each light contained 55 lamps.